Customers today can switch vendors in a heartbeat. If and when they do, there’s a good chance they will let the world know exactly why. Our research indicates that, in the past year, 66 percent of consumers worldwide switched companies due to poor customer service. This increasingly mobile, social and multi-channel world creates challenges to better understand and interact with customers. It also creates significant opportunities if you can get it right. Success in this environment comes from a customer-focused digital transformation that prioritizes a superior experience and aligns internal organization, processes and technology. The most valued and effective customer experiences are seamless, personalized, continuously optimized and powered by analytics. We’re the No. 1 systems integrator for Oracle technology globally. We're the first Oracle alliance partner to reach Diamond status. We’re one of the largest Oracle service providers, with more than 52,000 Oracle-skilled consultants. We have more than 10,000 CX practitioners. We have experience with large-scale, complex projects—more than 6,200 Oracle projects with more than half of the Fortune Global 100. The Accenture Solutions for Oracle Customer Experience provides end-to-end customer solutions by bringing together our industry-specific expertise in digital marketing strategy and Oracle technologies. We’ve got you covered from start to finish. Our solutions range from strategy to technical implementation, including customer relationship management, commerce, social media, mobility, data and analytics and digital marketing. CX Strategy Assessment and Roadmap. CX Blueprinting—For generating insights by helping define the holistic customer experience. Creative content strategy and design. Social media strategy and solutions—Based on monitoring, sales and customer care and collaboration. 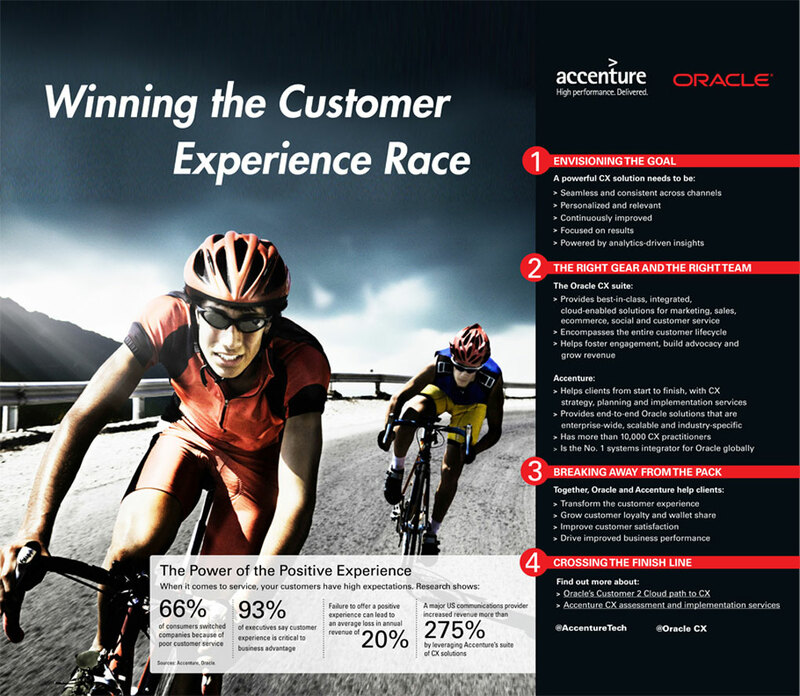 Customer experience implementation services—To accelerate your digital transformation with reusable components and assets (such as Accenture Foundation Platform for Oracle Customer Experience).